Information about the Queen Victoria replica Royal railway carriage model at Ballater Old Station in Royal Deeside Aberdeenshire. Includes photographs of the Royal Train and the Queen Victoria models, waiting room and carriage. 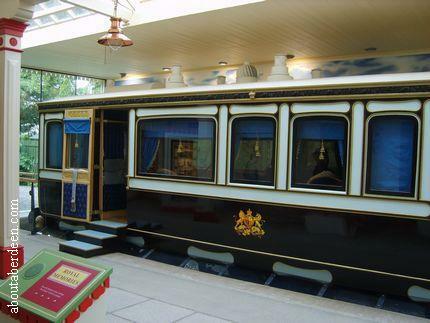 The Ballater Queen Victoria replica Royal railway carriage model opened to the general public on the 9 April 2008. It was unveiled by the Duke and Duchess of Rothesay who were both dressed in tartan with the Prince dressed in his Gordon Highland kilt and Camilla with a Balmoral tartan skirt. His Royal Highness Prince Charles was especially pleased to officially open the replica railway carriage with the model of his Great Great Great Grandmother because he has such fond memories of arriving at Ballater Old Station for Royal Family holidays from Windsor Castle. He now enjoys many stays at nearby Balmoral Castle with his wife Camilla, the Duchess of Cornwall, who also attended the official opening of the Ballater Queen Victoria replica railway carriage model. The Royal couple also unveiled a commemorative plaque. The day was doubly special for the Royal couple because it marked their third wedding anniversary. In Scotland the couple are known as the Duke and Duchess of Rothesay. 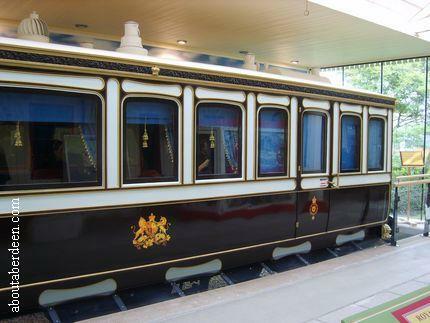 The Royal railway carriage is an exact copy of the one that would have been used by Her Majesty Queen Victoria and her husband The Prince Consort Prince Albert in the year 1869. The Old Station at Ballater in Royal Deeside, Aberdeenshire, has recently been restored and was opened by Prince Charles in 2002. It includes the Queen Victoria waiting room which now houses the Ballater tourist and visitor information centre next to the replica of the 15 tonne Queen Victoria Royal saloon railway carriage which was first installed in January 2008. The original Old Station dates back to 1866. In World War Two Royal Deeside was used as a training area for British troops and many soldiers used the railway line and station during this period. Over the decades since 1866 many members of the Royal Family and their international guests have used the station. 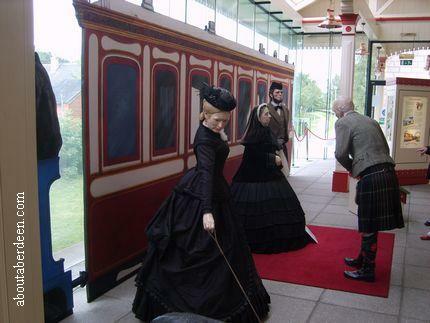 The Ballater Queen Victoria replica Royal railway carriage model was commissioned by VisitScotland. It measures 10.5 metres in length, is 2.5m in width and 3.8m in height.  If you have a photo of the official opening or of the Ballater Queen Victoria replica Royal railway carriage model that AboutAberdeen may use on this page or recall memories of the day then please contact us. Entrance to the Ballater Queen Victoria replica royal railway carriage model is at the VisitScotland information office. There is free disabled parking right outside with a larger car park yards away. Tickets to the Royal Train exhibition cost just �1 and this gives you admission onto the platform. 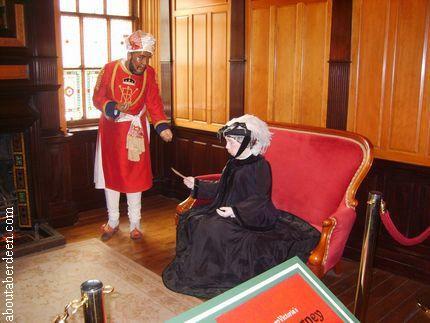 The Ballater Queen Victoria replica Royal railway carriage model is on one level making it suitable for those with a disability or pushing a pram or buggy. 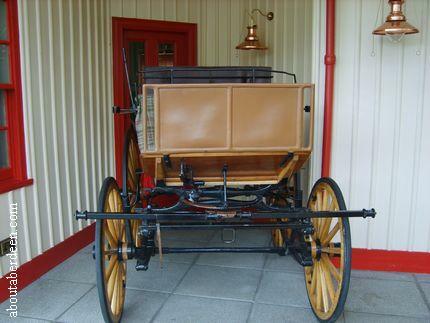 Here you will see the first exhibit which is the Victorian horse carriage that would have taken Queen Victoria and members of the Royal family from Ballater train station to Balmoral Castle. 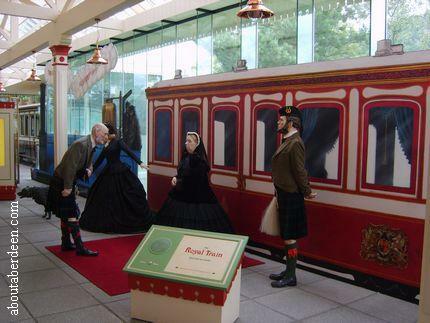 Next is the Royal Train with models of Queen Victoria, her Ghillie John Brown, her lady in waiting and dogs embarking from the Royal Train and being met by the Station Master. These mannequins have such detail and look very life like. 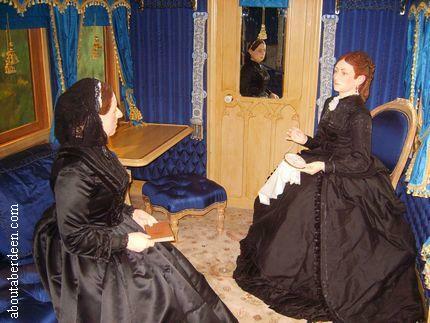 This Royal Train is not accessed by the public by the next one allows you to hop aboard and see models of Queen Victoria reading and her lady in waiting doing some embroidery in the Royal train carriage. A voice over recording which starts with the press of a button has two actresses acting Queen Victoria and her lady in waiting having a chat whilst her dog sleeps by her feet. There are other recordings scattered around the Royal Train exhibition. 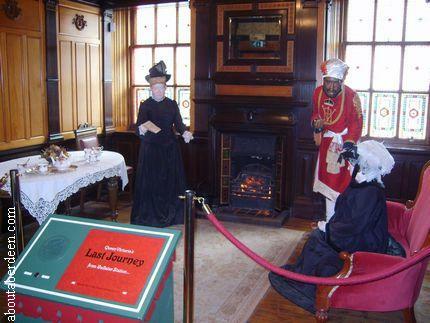 The waiting room used by Queen Victoria can be entered and takes you into a room with a mannequin of Queen Victoria and a model of an India servant who aboutaberdeen suspect may be her favoured servant Abdul Karim. There is period furniture and a welcoming fireplace. 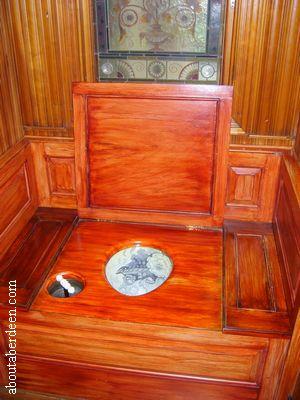 Two small rooms beside the waiting room are the Victorian toilet and wash room. In the middle of the Ballater train station platforms are various static displays such as the uniform of a soldier and diary extracts of Queen Victoria's life in the Highlands and Balmoral Castle. 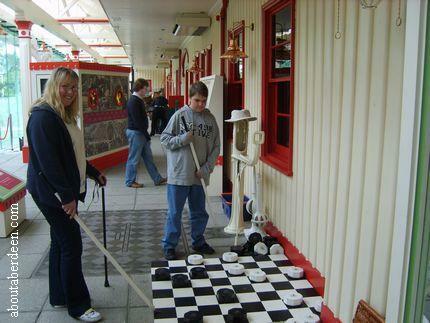 There are some games for the children on the platform and this includes a giant drafts board and a large mirror with masks to try on of Queen Victoria, her favourite servant John Brown and other famous people of the Victorian age. Other exhibits on the platform include a water pump and large weighing scales. 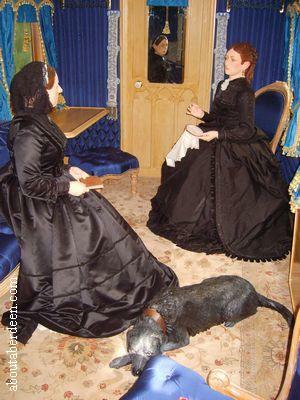 It took the aboutaberdeen.com team less than an hour to enjoy the Ballater Queen Victoria replica Royal railway carriage model, displays and exhibitions. Toilets are available in the tea room next door though these are reserved for paying customers. 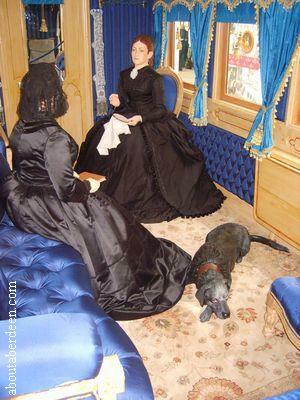 The original Queen Victoria 1869 day saloon carriage is at the National Railway Museum in York, England. Visitors are not permitted inside this carriage.